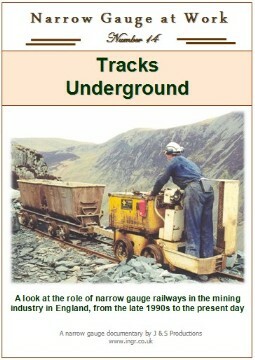 Narrow gauge railways were used extensively in the mining and quarrying industry in this country. This video explores some of those locations in England that were using narrow gauge railways until the end of the 1990s, and in some cases are still in use. The last regularly worked coal mine in the Forest of Dean opens the video. Hayners Bailey mine uses cable haulage to pull loaded tubs to the surface. A Simplex loco is used to haul large stone blocks underground for cutting at Rare Stone in Chilmark. The mines of Clarghyll Drift and Ayle Colliery are within a half-mile of each other, one using main and tail cable haulage, the other using Clayton Battery locos. Until the mid 1990s three mines produced fluorspar at Frazers Grove Complex and the drifts are seen in operation. Honister Slate Mine uses a single battery loco high in the mountains of the Lake District. The Battery loco of the Florence Iron Ore Mine is seen working underground. Finally the stockyard of the Berwick Drift Coal Mine owned by RJB Mining uses a couple of battery locos to move materials underground. Several other locations are also seen during the course of the video. Price including postage to UK: £14.00, for Europe outside of UK: £15.00, and for the rest of the world: £16.00. Berwick Drift Stockyard Date: 1995. Honister Slate Mine Date: 2000. Hayners Bailey (Monument) Coal Mine Date: November 2002. Alye Colliery Date: September 1999. Clarghyll Drift Mine Date: May 1997.